SGPC3, as well as SGP30, is based on the SGP multi-pixel platform and MOXSens? siloxane-resistant technology. The table summarizes the main differences between SGPC3 and SGP30. 30% of new buildings have poor indoor air quality (IAQ), 20% of individuals complain about temporary or chronic pains due to poor IAQ (Sick Building Syndrome), increased VOC values have a significant negative effect on cognitive abilities like strategic thinking and decision making etc. After power-on or reset, the sensor goes into sleep mode with consumption 2uA. Before the first measurement, it is necessary to warm-up the sensor for 16 to 184s depending on the sensor down-time. For details, see section 3.9 of the Driver Integration Guide Hardware Gas Sensors SGPC3. During this time, the sensor has a consumption of 48mA. After sensor warm-up, it is possible to start the measurement. Measurement typically takes 40ms, consumption is 48mA. Once the measurement is completed, the sensor enters sleep mode. For proper function of the dynamic baseline compensation algorithm, the measurement must be run every 2 seconds. If we neglect initial sensor warm-up and consumption during I2C bus communication, the average consumption will be: (40ms * 48mA + 1960ms * 0.002mA) / 2000ms = 0.98mA. SGPC3 allows reducing the average consumption to 65uA. In this mode, you have to run the measurement every 30 seconds. After the first power-on, the baseline is unknown. The sensor determines it as the minimum measured value of VOC concentration after twelve hours of operation. This value is valid for a maximum of one week. 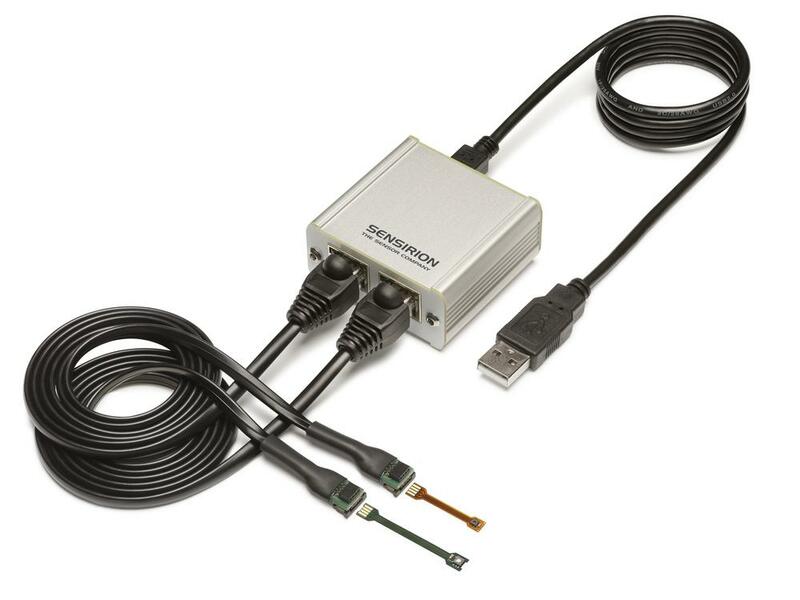 For more information, see the Driver Integration Guide Hardware Gas Sensors SGPC3. The limitation of the validity period of the baseline results from the properties of the MOX (metal oxide semiconductor) sensor. The reference value corresponds to a certain resistance of the sensing elements. However, these resistances are not constant at a constant concentration of VOC. Within weeks or months, they will change to such an extent that it could affect measurement accuracy. The algorithm compensates these changes and continually corrects the baseline. 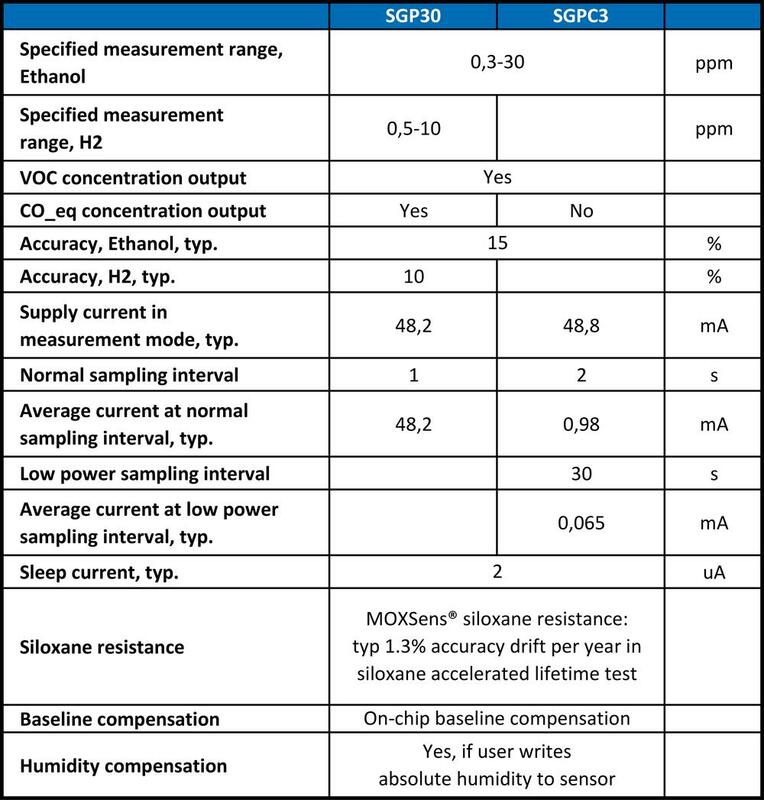 Ambient temperature and humidity changes causes the sensitivity characteristics offset in MOX sensors. SGPC3 has temperature-controlled micro-hotplate, which keeps temperature of the sensing element constant. To use built-in humidity compensation, just write actual absolute humidity value by Set_humidity command. 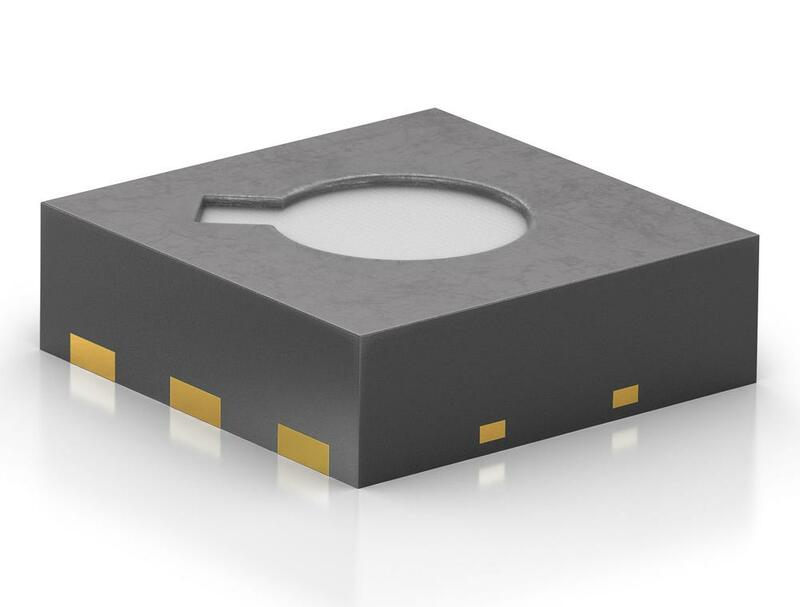 Airflow cools down MOX sensor sensing element and thereby changes its resistance. To prevent this, the top side of SGPC3 is covered by water and dust protection membrane, so the sensing element is not exposed to the airflow. In any case, it is always better to orient the sensor in such a way that the top side is parallel to the airflow. - Easy-to-integrate: I2C interface; 2.45 x 2.45 x 0.9mm DFN package; 1.8V power supply.